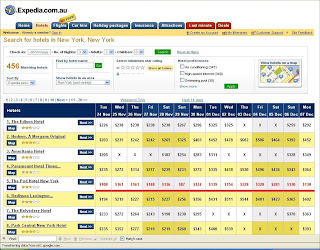 Care of a tweet from Kristi Barrow I came across a hotel sort order and search display experiment by Expedia in Australia (expedia.com.au). Below is a screenshot of the new display trial. As you can see it is a grid approach rather than the typical list and details approach. I am convinced this is only a test as I was only able to get these results in one of four searches I tried. Likely they are doing multi-variant (or A/B) testing here. You may be wondering why Expedia would trial a new (and arguably less user friendly) display on their Australian site. The reason is because of the market power of Wotif - the largest seller of online hotels in Australia. In case you have not looked at the Wotif site, they have a very different look and feel to a typical online hotel retailer. Instead of a list of hotels with a lead in room rate, they have a grid that shows all the hotels on the left side, dates at the top and then availability and price in the middle. In other words a dramatic increase in the amount of information shown to a consumer. The sacrifice being depth of hotel information, sort order management and date accuracy (ie a specific date range for a search). It is now standard in Australia but very different to other markets. By standard I mean it has influenced other players. Local competitors such as needitnow (AOT group) checkin and quickbeds (Fight Centre) have followed suit with this layout. 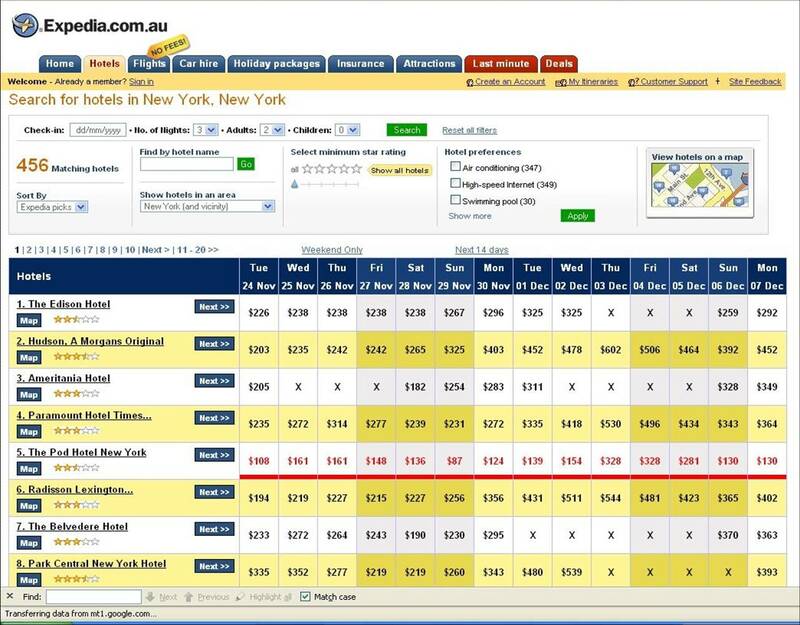 Clearly Expedia has also caught the Wotif bug and is interested in trialling this layout in Australia. Thanks to Kristi for sending the story around. i notice the expedia version does not have the rack/full rate to the left of the actual rates. i think that is a very important parts of the matrix, at least for me, given the bigger the gap the better deal "i think" im getting. I'd say that's why Expedia doesn't show rack rate. People don't believe them anymore. But @steve comments are an interesting example of human perception and one I admit I've also sometimes done in the past but now immediately ignore. When seeing an indicative normal rate I might see a notional value in the discount briefly but pretty quickly discard it knowing I'll never, ever have to pay that rack rate. Aren't we now all so used to seeing the deal price that the old rack rate is irrelevant and should be removed? I'm now just comparing hotel to hotel on the deal price? Expedia doesn't show rack rate. People also don't believe them. From where I am standing it is interesting to see the different views both on web page design and things like indicating a rack rate. I am not sure what the value is of indicating a rack rate any more given the nowadays freely used "best price guarantee". I think this is what is drawing more attention. However, with the number of sites having this guarantee, I wonder how they in fact guarantee. @ Carl Jackson - I have to agree with you in part because I don't think people really look at rack rate anymore. My experience is people booking online will simply compare advertised rates and book at the lowest price with a business they feel they can trust.